As a Christian, living in the Mystical Body off Christ, I can choose to live in the joy of the Lord or stay in my misery, isolated from the Spirit of God who dwells within. When I live in my head, I live in a prison of whirling thoughts cut off from others and God. If I go deeper into my being and live in my human emotions, in pain or in self-manufactured “happiness”, I end up stuck as a victim of others and in my sinful, independent self. However, if I allow God to draw me even deeper into my core, united to Him, joy springs up automatically. Now I exist in a state of effortless prayer connected to God. Living in my spirit , as a child of God, I am in my true self. 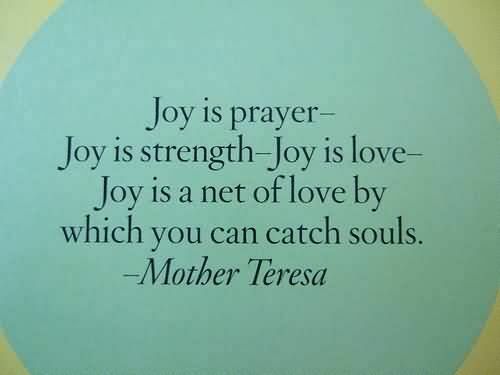 This joy is the contagious Presence of the Holy Spirit, blessing others with a taste of the Father’s love.